Unique & Romantic themed hotel rooms. Unusual hotels in UK. One of the unique hotels with some of the most romantic themed hotel rooms in UK. The original Crazy Bear has been entertaining guests since its creation in 1993. Abundant gardens, eclectic design, award winning dining and inventive facilities, within eighty acres of working farmland all contribute to its distinctive personality. The Crazy Bear Stadhampton is a unique oasis in a countryside setting, and is the foundation for our Crazy Bear culture. 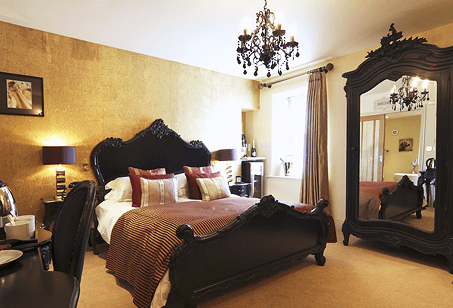 Eclectic choice of sixteen individually designed & themed bedrooms. Unforgettable luxury hotels with romantic themed hotel rooms. 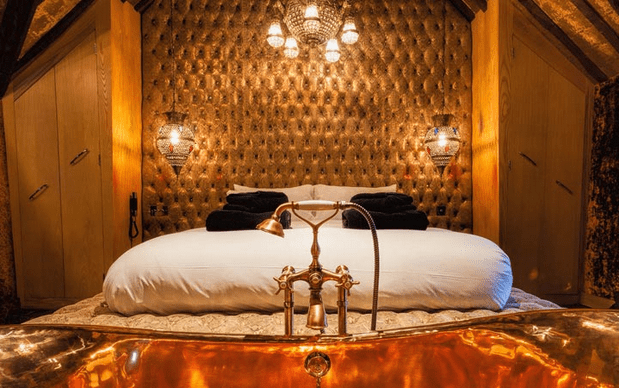 The Crazy Bear Beaconsfield opened in 2008 to spectacular international reviews including Conde Nast’s Red Hot List for best new hotels in the world. The oldest documented building in Beaconsfield, a fifteenth century coaching inn, has been meticulously restored and elaborately designed to provide dramatic architecture and uncompromised luxury. The Crazy Bear Beaconsfield is a unique oasis in quintessential England and the antithesis to bland hotels. A unique experience to stay on the yellow sub. This was originally built around the concept of the sub in the film THE HUNT FOR RED OCTOBER with Sean Connery. In the lounge there are gold discs from The Beatles , the mod scooter from the film Quadrophena, the furnishings are from Paris, Italy and New York, and the master bedroom is based on the suite at the 7 star Burj Al Arab in Dubai. There is a 52inch TV in lounge and also in the bedrooms with full Sky TV, and the best location in the city for all the night life and shopping. 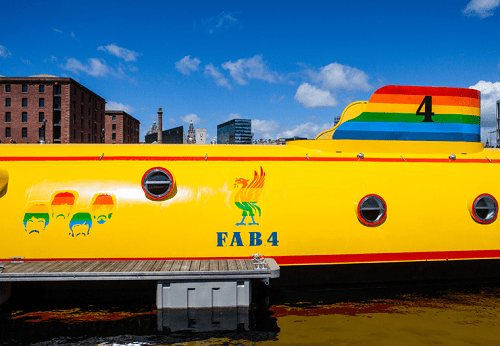 The sub is located right in the heart of the Albert Dock, no car required, you can walk to all the attractions. 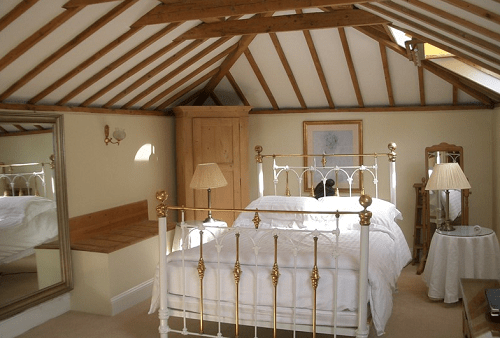 Some of the most romantic themed hotel rooms in UK. Formerly Petworth Railway Station, built in 1892 – now the perfect place to relax in colonial splendour. You may choose to stay in the Old Station or….step back in time and board the train. The Old Station House has been restored with care, retaining its original features and character including the Waiting Room and Parcels Office, which is now used as the Reception. One of the most unusual hotels with historical & romantic themed hotel rooms. Sky Suites amplify the indulgent personality of the hotel with walk in wardrobes, generous bath tubs, Missoni blankets and space to lounge surrounded by dark wood Venetian blinds. An unique aviation themed hotel with design & romantic themed hotel rooms. Whether you are requiring a weekend getaway, a short holiday or an overnight stay, the Heifer is the perfect location for a relaxing break. Dine in the hotel’s award winning restaurant, sit in our Whisky Club room for after dinner drinks then retire to your luxurious room. 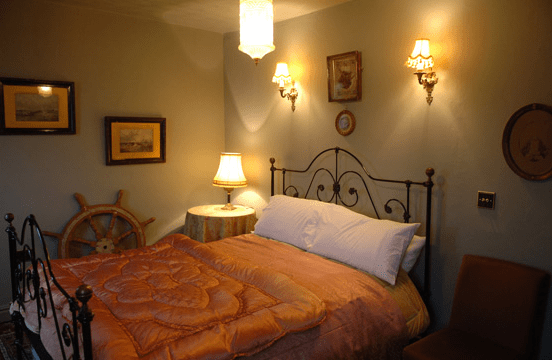 Some of the themed rooms are: Black Sheep, Malt Whisky, Chocolate, Four Poster, Shooters, James Herriot, Champagne, Night at the Movies and more. Some of the unforgettable & most romantic themed hotel rooms. The Nitenite Hotel is decorated in comfort and chic conscious interiors. Every clever creation is designed for the optimum use of the compact and efficient space emulating the feel of that luxury yacht cabin. This forward thinking and unique concept is a designer luxury that is very truly affordable. 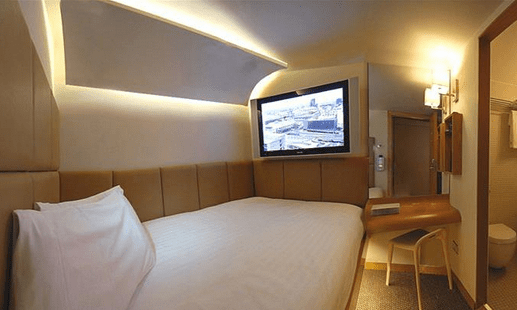 The cabin style rooms have no windows but feature a 32-inch HD TV with a view of the Birmingham SkyLine. All rooms are fully air-conditioned with custom controls and mood lighting. The room includes tea/coffee-making facilities and a private wet room with a powerful shower and a heated mirror. Unusual hotel with intimate & romantic themed hotel rooms. Unique vintage hotel with unusual romantic themed hotel rooms. The hotel is housed in a beautiful early Victorian building on West Cliff in Whitby with amazing views out to sea. Number 5 East Terrace is ‘blue plaqued’ as the place where Lewis Carroll resided during his many visits to Whitby. 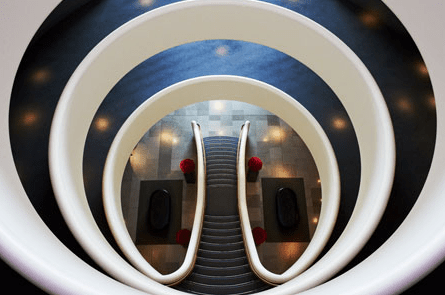 The hotel is furnished with vintage and antique finds from auctions, flea markets and car boots. 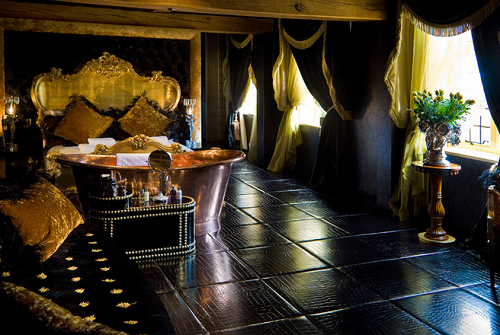 More boudoir than boutique, there are romantic rooms each with a distinctive La Rosa style and theme.